For many players Pot Limit Omaha is a great game to play to break away from the daily grind of Texas Hold’em. There tends to be more action and you develop great hands more often. However, one of the biggest problems that players tend to face is the fact that everywhere you turn there is a better hand to draw to. Almost every card you have in the hole can be turned in to something. How do you prevent yourself from drawing to too many hands? We are assuming you’ve already got a basic understanding of the Omaha poker rules. While it would be impossible to go through every scenario, it is possible to shed some light on hands you will need to be more careful playing. Generally you will find that pairs in Omaha do not mean much as with straight draws and flush draws. You will find most times that even though you may have a great drawing hand on the flop, you can hit it on the turn and if it is not the nuts, you can fall way behind on the river. To better explain some scenarios, we have provided a few example hands so that you will have an idea of what to look for at your next Omaha game. The first thing you need to look at is your hole cards. Do you have 2 suited cards? Do you have more than 2? If you have 3 or 4 cards of the same suit in your hand you will need to be careful as you will have less outs to draw to. When the flop comes, if you do not have at least 4 cards to the flush, do not bother and more so if you are not drawing to the nuts. If you have something very low like a 4-5 suited, be careful on flush draws. It will not take much to be out kicked here by anything of the same suit. Not only that, but at lower stakes many players will call if they have it regardless of how strong it is. Is there two different kind of flush draws on the board? Meaning that by the turn, can you possibly see 2 different flushes being made? If so, I would draw very cheaply if possible to see if you can hit. Straights draws can be dangerous. Straights can be exceptionally dangerous due to the likelihood that someone is drawing to a flush or a full house. Be sure to analyze the flop, turn, and river carefully to know what the best course of action is. If you have a backdoor straight you will want to go to showdown as cheaply as possible. Sure, it is possible to win more but on the same note, it is possible to lose more as well. If you are holding 10-2-9-7 and the flop comes J-Q-K, you may have hit your straight, but someone may have hit a higher one. Not too mention that implied odds could play a big part and they will draw to it if they feel like they can take all your money provided they hit. If you are playing Hi/Lo Omaha, then be sure to play flops that allow you to draw to a low and hi hand. Meaning if you have A-3-10-10 in the hole and the flop comes 2-5-7, you will have hit a low hand with a great draw to the straight. Not to mention that you have an overpair in your hand as well. As mentioned before, you will want to play hands a little bit more aggressively if you already hit either a hi or low and are drawing to the other. You will want to play these harder because the times you do hit will easily pay for the times you do not. Be sure to avoid multi-way pots most times regardless of what you are holding. If you are drawing to a low hand and it is more than likely that you will not “scoop” the pot while there is more than one other player in the hand, do not bother. If one player wins the “Hi” pot, and you and another player win the low pot, you will have to split it. This will return less money than you invested giving you a negative -EV in the long run. Most times in Hi/Lo you should try to have some sort of low hand as well as hi hand as starting cards. This will help immensely for making a decision after the flop. Now obviously these are not all the scenarios that you will face in Omaha or Omaha Hi/Lo. But it will be the most common. It is crucial to watch out for hands that you are not holding the nuts to. If you do not have the best 5 card flush, straight, or hi/lo hand, you are putting yourself at risk with a mediocre hand. Although it is possible to do well and win chips with hands like these, you should just plan on playing them cautiously to be sure you do not lose more than is necessary. 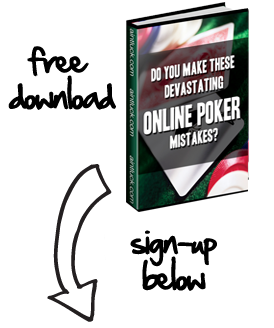 Author: 4kingpoker.com - Poker forum, strategy, tips, and online poker sites reviewed.